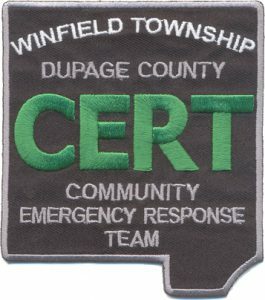 In cooperation with other DuPage County Townships Winfield Township now offers regular CERT training C.E.R.T. Patch throughout the year at the very professional HOMELAND SECURITY and EDUCATION CENTER on the campus of College of DuPage. CERT is a free service, professionally taught by local fire fighters, police, and medical staffs. CERT is training every volunteering citizen should have preparing your family first for disaster and then beyond to actually help the first responders. You will be STATE certified, fully equipped, and prepared should disaster strike. and your household is essential. the chaos if an incident does occur. Click on the links below to see if you are ready for?